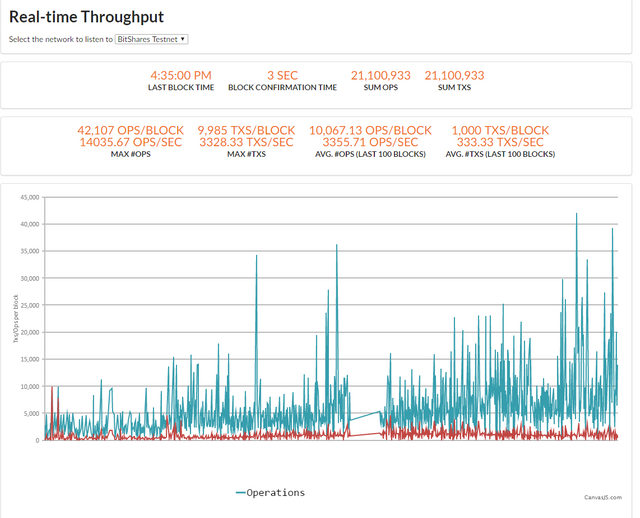 We also were able to reduce the Block time from 3 to 1 seconds seamlessly. No forks, no witness hookups, just smoothly 500 txs per second with 1-second block time. Big thanks to the whole team who participated in this stress test, especially, @xeroc for the stats page and @valentin for the live stream. Congratulations to @xeroc, @valentin and the Team! When i get more time ill watch more of the video its a bit long. Ive been hearing some good things about bitshares, but must the info i get tends to be people trying to score refs. I;m happy to learn about it but id rather not be targeted and to be given some decent material. Your reward for being in Promoted is an upvote and 0.004 SBD extra promotion. What are the differences between OPS and TXS and what is behind the increase in TXS at bitshares? A operation is a bundle of transactions, like a dividend payout with one source and multiple beneficiaries. So the sender will sign one transaction which contains multiple operations. So there is always one operation, but you can bundle several operations to a bigger transaction. Where can I read more about the limiting factors? I'm always baffled why ether is so popular when Bitshare is so much better. It's marketing.. The expectation is that Bitshares can handle more than that. That is so cool! Congrats guys! I would like to ask you a question about Blockpay. Can you explain me how come we are now going to have 100 Millions token, if I invested in Blockpay it was because of the small market cap. Could you maybe explain me what will be the benefits for the early investors? Our tokens will simply lose value, no? thank you for your good question. The benefits for early investors are the lower prices and future discount for the ITO. I am working on the details right now and early investors always good a bonus from us. Ok thanks for your reply Chris.